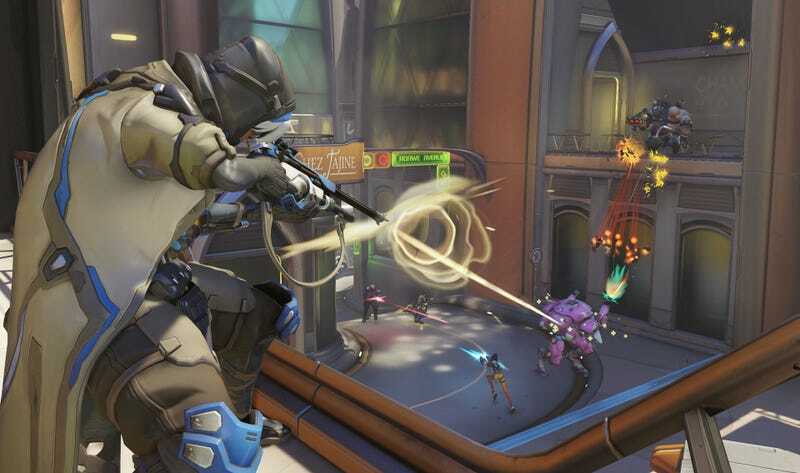 Overwatch’s new hero, Ana, is currently on the game’s public test servers. I’ve spent the past hour-and-a-half trying her out, and while this should hardly be taken as an in-depth appraisal, she is, so far, damn fun to play. Ana is a support sniper. The basic idea—a sniper who shoots people in the head with love and kindness—is comically preposterous, a perfect example of how Overwatch grabs stone-faced first-person shooter tropes and turns them to goofy gold. It’s the way that Ana slots into the game’s overall ecosystem, however, that takes her from fun concept to great character. While Overwatch’s other line-of-sight-based healer, Mercy, can basically only heal OR do (meager) damage at any given moment, Ana seamlessly does both. Popping off shots with your sniper rifle? If you hit a teammate, you heal. If you liquefy the brains/guts/robot/robot’s pet bird of an enemy, you do damage. Tossing your grenade? Same deal, but with a nice buff to healing for friends and a temporary block on healing for foes. You’ve also got a sleep dart to mitigate distance closing and flee from close quarters encounters. Then there’s Ana’s ult, which turbo charges an ally of your choice. Nano Boost makes them move faster, deal significantly more damage (50 percent, I believe), and take less damage. Wanna leave the other team strewn across the battlefield like so much celebratory confetti? Coordinate ults with Genji and relish the fact that your enemies will curse your name as they fall asleep and tumble through dark dreams. Her grenade doubles as a wicked effective self-heal. If you get popped with a good shot, toss it at the ground near you as you’re ducking or fleeing. You’ll get a solid chunk of your health back, and if your enemy is nearby, they’ll pay dearly for strolling into the Cool Mom section of their local warzone. Ana is constantly active. You can shoot anybody, after all, while occasionally dropping grenades right in the middle of skirmishes. Unlike Widowmaker, who’s all about lining up perfect shots, Ana can afford to fire a bit more indiscriminately. Now, you should of course focus fire on friends who need heals and buffs (if it helps, Ana’s damage output is only so-so), but you’ve got options. Because Ana is almost always healing or doing damage, her ult fills up with a quickness. It’s damn satisfying to raise someone into a glowing beacon of infinite potential and then focus healing fire onto them until all nearby threats are dead. While I’m no expert, I imagine that’s exactly what motherhood is like. When you’re firing off heal shots, pay close attention to sound effects. As an ally’s health gets closer to topping off, the sound effect changes markedly. It’s super useful! Ana has a frightening amount of potential as a counter-healer, as well. Between grenades that temporarily prevent heals and her ability to sleeping dart Mercy, she can effectively render enemy teams helpless for brief bursts of time. Ana and her daughter, Pharah, are gonna have so much to talk about after that whole, you know, “being presumed dead for a decade” incident. Ana’s voice actress is actually Egyptian. Nice one, Blizzard. There are some things about Ana that I’m not 100 percent on. She can be pretty tough to wrap your head around at first. If you’re not both a decent sniper and an excellent split-second decision-maker, you risk being dead weight for your team. As with Widowmaker, a poorly played Ana doesn’t even take up valuable space on the front/mid line. In some ways, your team would benefit more if you were literally anybody else. That said, Ana can hit allies in the head or body and still heal them, and her hitbox is almost absurdly generous. Ana lacks Widowmaker’s mobility and offensive capabilities, and I’m not sure if she’ll be able to compete with Mercy as a pure healer, but she sits very comfortably between the two. She’s hecka satisfying to play, and her arsenal of capabilities comes together with an elegance that belies just how many options she has at any given moment. I need to spend more time trying her out before I’m certain, but at this rate Ana could very well become one of my favorite Overwatch characters.